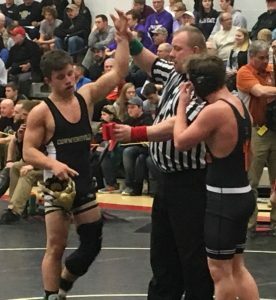 HYDE — An offseason injury kept Zach Holland out of the Curwensville Area High School wrestling lineup in December and January, but it didn’t prevent him from reaching one of his goals for the 2018-19 season. The determined and focused Golden Tide junior, who made only two dual meet appearances, fought his way to two very tough, one-point decisions over higher seeds Saturday to win the District 9 Class AA 145-pound championship in Clearfield Area High School’s Bison Gym. He broke free from No. 2 seed Colton Gietler of Oswayo Valley with just six seconds on the clock for a 3-2 victory in the semifinals and then exploded out of a leg ride by No. 1 seed Issac Smoker of Port Allegany for a reversal with 31 seconds left in their title bout to prevail 2-1. “Zach had two great matches,” Curwensville coach Dean Swatsworth said. “He’s had a good mindset this year, and he knows how to push himself to win. As elated as Holland was claiming a gold medal after losing in the finals at 106 as a freshman and placing fourth last year at 132, Golden Tide senior 126-pounder Blake Passarelli was equally dejected and disappointed being on the opposite outcome of a heart-breaker in his bid to join the list of repeat champions after making the jump from 113. Brockway junior Anthony Glasl was able to control Passarelli in the 30-second ultimate tiebreaker period after they had traded escapes in regulation and overtime to emerge with his 100th win, 3-2, and become a three-time district champion. Like his teammate, Passarelli reached the finals with a hard-earned semifinal win, taking down Mason Songer of Redbank Valley late in their first overtime period for a 3-1 sudden victory. That will be in the Northwest Region Tournament at Sharon where Passarelli and Holland will be joined by Golden Tide senior Cole Bressler, who placed fourth at 160. Holland, the No. 3 seed, gained the advantage against Gietler by bullrushing him for the takedown 38 seconds into their semi match, but the Oswayo Valley junior tied it up with a takedown at the second period buzzer after choosing to go neutral. Overtime appeared imminent the way Gietler was riding in the third period, but on a restart with 15 seconds left, Holland broke free. Against the taller Smoker, Holland maintained control in the middle period by riding with legs most of the two minutes but did give up a penalty point for interlocking. Smoker returned the favor in the third period with a grapevine ride that seemingly had the bout headed for overtime. However, Holland caught Smoker on his side and powered his way to the winning reversal with less than 30 seconds to go. Passarelli had to work hard, too, to become a four-time district placewinner, which might be a first for the Curwensville program. He finished fourth as a freshman and third as a sophomore before climbing to the top of the podium last year. He and Songer spent all but six seconds of their semi match sparring for takedowns as they traded escapes. In the one-minute extra period, Passarelli hit a picture-perfect duck-under for the winning takedown with nine seconds remaining. Passarelli’s duel with Glasl, who had beaten him 8-2 in their dual-meet bout last week, was similar in that the only points came on escapes before Glasl prevailed via the seventh-period rideout after the Golden Tide standout opted for the bottom position. “You’ve gotta figure the odds,” Swatsworth said. “Unfortunately, Blake didn’t get out like he did the first two times. When you have two great wrestlers like that, you can expect anything. After being pinned by eventual champ Alec English of Kane in the semifinals, the fourth-seeded Bressler rebounded to extended his season with an 11-0 major decision over Wyatt Griffin of Brookville in the consolation blood round. In the bronze medal bout, Bressler took down Isaac Zimmerman of Johnsonburg twice and was leading 5-3 when the No. 3 seed reversed and cradled him three times, getting the fall at 2:47. The season ended in the consolation quarterfinals for freshman Jacob Carfley at 106, sophomores Duane Brady at 152 and Jake McCracken at 170 and senior Alec McGarry at 220. Curwensville finished seventh in the 13-team tourney with 59 points. “Honestly, I was proud of the whole team,” Swatsworth said. “We wrestled kids who were seeded higher and gave them all they could handle. I’m just proud for them to go out there and give 100 percent and go after someone. In addition to Glasl and English, three heavyweights repeated as gold medalists, Brockway’s senior Garrett McClintick at 182 and junior Eric Johnson at 195, up from 160 last year, and Brookville’s nationally-ranked junior Colby Whitehill at 285, the latter with three falls in 1:41. Like Passarelli, Port Allegany junior Bryent Johnson came up short in his attempt to earn a second gold medal, losing to Brookville freshman Owen Reinsel 8-2 in the finals. Kane had four champs in English, Noah Blankenship at 138, Aiden Hulings at 152 and Ty Stahli at 220. Sophomore Trenton Rupp at 106 and junior Ethan Wiant at 132 made Redbank Valley the fourth team with multiple champions. Also walking away with gold medals were sophomores Braedon Johnson of Port Allegany at 120 and Ethan Finch of Sheffield at 170. Finch, a No. 4 seed, was selected for the Joseph J. Kata Outstanding Wrestler Award by the coaches after defeating No. 1 Elliot Park of Brookville 5-3 (SV) in the semis and No. 2 Tyler Watts of Johnsonburg 8-5 in the finals. The Lenny Ferraro Coach of the Year Award went to Eric Grecco, whose Brockway Rovers ended Brookville’s five-year run as team champions with 171.5 points. 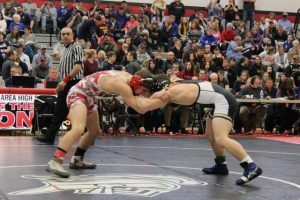 Three champs and two silver medalists are among Brockway’s 11 region qualifiers. Kane finished nine points back in the team chase behind nine placewinners, while Brookville was third and Port Allegany edged Redbank Valley for fifth. District 9’s medalists will join eight District 10 qualifiers at each weight in the Northwest Region Class AA Tournament at Sharon High School next Friday and Saturday. 1. Brockway (Bw), 171.5 points; 2. Kane (K), 162.5; 3. Brookville (Bv), 135; 4. Port Allegany (PV), 127.5; 5. Redbank Valley (RV), 126; 6. Johnsonburg (J), 92.5; 7. Curwensville (Cur), 59; 8. Sheffield (S), 50; 9. Coudersport (Cou), 39; 10. Clarion (Cl), 28; 11. Oswayo Valley (OV), 27.5; 12. Ridgway (R), 26; 13. Cameron County (CC), 10. 106 – (1) Owen Reinsel, 9, (30-3), Bv, dec. (2) Bryent Johnson, 11, (21-5), PA, 8-2. 113 – (2) Trenten Rupp, 10, (21-8), RV, dec. (1) Reese Vollmer, 12, (25-3), PA, 10-23. 120 – (1) Braedon Johnson, 10, (31-1), PA, pinned (6), Harley Morris, 9, (22-10), K, 4:21. 126 – (1) Anthony Glasl, 11, (31-1), Bw, dec. (2) Blake Passarelli, 12, (24-6), Cur, 3-2 (UTB). 132 – (1) Ethan Wiant, 11, (31-6), RV, pinned (3) Nolan Shaffer, 10, (27-9), J, 3:42. 138 – (1) Noah Blankenship, 12, (26-6), K, won by injury default over (3) Hunter Martz, 12, (7-6), RV, 2:37. 145 – (3) Zach Holland, 11, (5-0), Cur, dec. (1) Issac Smoker, 12, (25-5), PA, 2-1. 152 – (2) Aiden Hulings, 12, (26-3), K, dec. (1) Cole Casilio, 10, (32-3), J, 8-2. 160 – (1) Alec English, 12, (29-1), K, dec. (2), Noah Bash, 10, (25-8), Bw, 7-0. 170 – (4) Ethan Finch, 10, (27-8), S, dec. (2) Tyler Watts, 11, (26-6), J, 8-5. 182 – (1) Garrett McClintick, 12, (31-1), Bw, dec. (6) Braden MacBeth, 12, (21-11), Bv, 6-0. 195 – (1) Eric Johnson, 11, (28-6), Bw, dec. (3), Justin Young, 10, (30-4), 9-6. 220 – (1) Ty Stahli, 12, (25-6), K, dec. (2) Tanner LaBenne, 12, (20-10), BV, 4-2. 285 – (1) Colby Whitehill, 11, (32-0), Bv, pinned (6) Hayden Thompson, 12, (16-9), Bw, :46. 106 – (3) Mark Palmer, 9, (28-8), Bw, major dec. (4) Ridge Cook, 9, (22-10), 9-1. 113 – (3) Cayden Walter, 10, (25-8), Bv, dec. (4) Dillon Illerbrun, 10, (18-12), K, 7-3. 120 – (2) Brayden Altobelli, 12, (26-7), RV, dec. (3) Dom Inzana, 10, (22-6), Bw, 4-2. 126 – (3) Mason Songer, 12, (30-4), RV, tech fall (4) Parker Fleming, 11, (13-18), 18-2 (4:19). 132 – (4) Eli Petruzzi, 11, (28-8), PA, pinned (8) Dylan Kelly, 9, (12-16), Cou, 2:14. 138 – (2) Tino Inzana, 12, (19-10), Bw, dec. (4), 10, (15-5), Dalton Stahli, J, 5-2. 145 – (2) Colton Gietler, 11, (24-9), OW, tech fall over (7) Dalton Bish, 10, (16-9), RV, 23-6 (4:30). 152 – (5) Jacob Wickett, 11, (14-11), R, dec. (4) Jacob Cable, 12, (19-14), Bv, 2-1 (TB-2). 160 – (3) Isaac Zimmerman, 10, (27-8), J, pinned (4) Cole Bressler, 12, (15-11), Cur, 2:47. 170 – (3) Cameron Whisner, 11, (25-8), K, dec. (6) Andrew Hickman, 11, (19-17), Bw, 4-2. 182 – (2) Teddy Race, 11, (18-4), K, pinned (3) Hudson Martz, 10, (23-10), RV, 4:36. 195 – (2) Elijah Ayers, 12, (28-3), Cou, dec. (6) Tyler Van Tassel, 12, (5-3), Cl, 6-0. 220 – (4) Cale Ayers, 10, (23-9), Cou, pinned (3) Justin Smith, 12, (13-8), Bw, 2:07. 285 – (2) Nick Knowles, 12, (26-5), S, pinned (4) Shawn Nystrom, 9, (11-8), K, 2:22. 106 – Palmer, Bw, pinned (5) Alex Bachas, (18-10), K, :46; Cook, RV, dec. (6) Derek Peterson, 9, (19-13), J, 5-0. 113 – Walter, K, pinned (5) Ben Cornish, 9, (7-12), Cou, :14. 120 – Altobelli, RV, pinned (8) Josh Popson, 9, (10-17), Bv, 3:12; D. Inzana, Bw, dec. (4) Login Dehner, 12, (20-9), Cl, 4-2 (SV). 126 – Fleming, Bv, dec. (6) Gary Emerick, 11, (18-13), R, 7-2; Songer, RV, pinned (5) Isaiah Caden, 10, (6-5), PA, 2:01. 132 – Petruzzi, PA, pinned Luke Tomaski, 12, (12-16), R, 2:18; Kelly, Cou, won by medical forfeit over (2) Cabe Park, 12, (13-6), Bv. 138 – D. Stahli, J, pinned (6) Montgomery Tanner, 11, (18-14), PA, :49; T. Inzana, Bw, dec. (5) Wyatt Kulik, 11, (18-14), Bv, 4-3. 145 – Bish, RV, PA, dec. (4) Cameron Marciniak, 9, (15-5), J, 2-1; Gietler, OV, major dec. (5) Cole Hetrick, 11, (11-16), Bv, 12-3. 152 – Wickett, R, dec. (6) Linkin Nichols, 11, (13-13), Bw, 7-1; Cable, Bv, dec. (3) Cutter Boggess, 10, (21-10), Cl, 5-4. 160 – Bressler, Cur, major dec. (7) Wyatt Griffin, 10, (16-15), Bv, 11-0; Zimmerman, J, tech fall over (8) Wendell O’Brien, 11, (5-6), CC, 17-2 (4:17). 170 – Hickman, Bw, pinned (1) Elliot Park, 10, (21-12), Bv, 1:58; Whisner, K, dec. (5) Derek Kallenborn, 10, (18-17), PA, 10-5. 182 – Race, K, pinned (5) Christian Krug, 11, (11-16), J, 3:36; Hud. Martz, RV, dec. (4) Dalton Distrola, 10, (17-15), PA, 6-5. 195 – Van Tassel, Cl, dec. (4) Aiden Gardner, 10, (28-4), RV, 2-1; E. Ayers, Cou, dec. (8) Nathan Taylor, 10, (18-12), Bv, 9-2. 220 – Smith, Bw, pinned (5) Maximus Thomas, 10, (6-4), S, 1:50; C. Ayers, Cou, major dec. (7) Maximus Ehrensberger, 12, (8-15), R, 10-2. 285 – Knowles, S, pinned (5) Zack Kellerman, 12, (8-18), Cl, 3:14; Nystrom, K, dec. (3) Kobe Bonnano, 10, (13-9), RV, 4-3. 106 – Reinsel, BV, pinned Cook, RV, :13; Bry. Johnson, PA, dec. Palmer, Bw, 9-5. 113 – Vollmer, PA, pinned Illerbrun, K, 5:17; Rupp, RV, dec. Walter, Bv, 3-2. 126 – Glasl, Bw, tech fall over Fleming, Bv, 15-0 (2:54); Passarelli, Cur, dec. Songer, RV, 3-1 (SV). 132 – Wiant, RV, pinned Petruzzi, PA, 2:20; Shaffer, J, won by injury default over C. Park, Bv, 1:24. 138 – Blankenship, K, pinned D. Stahli, J, 3:54; Hun. Martz, RV, pinned T. Inzana, Bw, 5:45. 145 – Smoker, PA, major dec. Marciniak, J, 9-1; Holland, Cur, dec. Gietler, OV, 3-2. 152 – Casilio, J, dec. Wickett, R, 6-2; Hulings, K, dec. Boggess, Cl, 1:56. 160 – English, K, pinned Bressler, Cur, 2:43; Bash, Bw, pinned Zimmerman, J, 5:18. 170 – Finch, S, dec. E. Park, Bv, 5-3 (SV); Watts, J, dec. Whisner, K, 2-1. 182 – McClintick, Bw, tech fall over Distrola, PA, 16-0 (3:44); MacBeth, Bv, dec. Race, K, 5-4. 195 – E. Johnson, Bw, dec. Gardner, RV, 6-3; Young, PA, dec. E. Ayers, 8-4. 220 – T. Stahli, K, dec. C. Ayers, Cou, 6-2; LaBenne, Bv, pinned Smith, Bw, 1:50. 285 – Whitehill, Bv, pinned Nystrom, K, :47; Thompson, Bw, pinned Knowles, S, 2:23. 120 – Peterson, J, pinned (7) Jacob Carfley, 9, (14-11), Cur, :42. 152 – Cable, Bv, dec. Duane Brady, 10, (13-15), Cur, 2-0. 170 – Hickman, Bw, dec. (7) Jake McCracken, 10, (17-13), Cur, 4-3. 220 – Thomas, S, pinned (8) Alec McGarry, 12, (3-7), Cur, 2:52.